Written by Tjasa Zajc on November 15, 2017 . Posted in MEDICA, Trends. 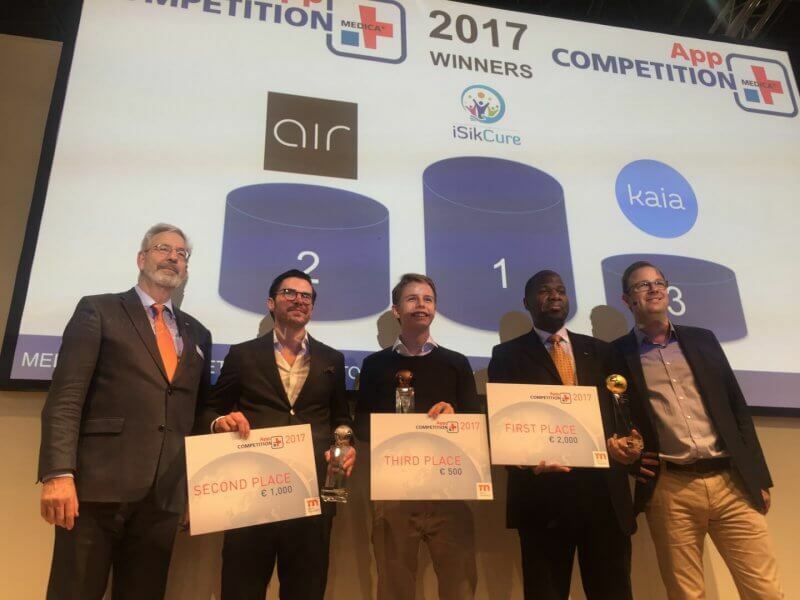 Among 15 startups pitching at this years MEDICA App Competition, the top three chosen solutions are Kaia, air and iSikCure. Kaia is a mobile app addressing back pain by using AI to guide patients through therapy and selected exercises which are moderated through camera observation of the users posture. air is a smartphone app with a connected spirometer guiding users through spirometry measurements. It is meant to be used either by asthma patients or by physicians during patient examinations. The winning solution on the competition was iSikCure app, connecting patients to healthcare providers and using a special reward points system creating a new way to pay for health services and encouraging medication adherence. iSikCure is the winner of MEDICA App Competition 2017. See all 15 startups pitching at the competition here. In the pre-competition program different topic on mHealth development were discussed. Ralf-Gordon Jahns presented the latest Research2Guidance research findings on mHealth market. At the moment, the estimated number of mHealth apps is 325,000, with health insurers becoming an increasingly important distribution channel for scaling. mHealth apps still face the problem of monetisation and 55% of apps have less than 5,000 downloads, was mentioned. Full report is freely available here. What’s the deal with mHealth apps? different reasons for low mHealth apps adoption and user retention were mentioned. An important critical point of apps is that they remind users of their sickness, which can be discouraging for continued use. This is one of the recognised reasons for a lot of B2C apps failing in the last years. A lot of them shifted to B2B2C business models. Since payments in healthcare are shifting in the direction of outcomes and value based payments, apps are becoming increasingly interesting for Pharma companies offering their patients additional support and value through platforms and apps. In terms of trends, voice recognition solutions are attracting interest, alongside expectations that app usage will increase with an improved experience provided by solutions coming from big corporations such as Google, Amazon and Apple, which have detailed knowledge about what works in customer engagement which could potentially be translated in to healthcare. FTR4H is going to SXSW! Wednesdays program at the Connected Healthcare Forum at MEDICA Trade Fair, prepared by Future for Health Community, was this years last FTR4H event. Next years roadshow includes presence in USA, India, China and Germany. The first event in 2018 will be a conference program a SXSW festival, one of the top global tech events, attracting leading tech companies from the US and abroad. We are proud to be a part of it as it presents a valuable opportunity to meet tech savy entrepreneurs from different industries, allowing a step out of the digital health bubble and enabling formation of new ideas for the healthcare space. More information will be published soon. If you’re interested in participating as a company, do not hesitate to contact us!